What is Nature Camp? And Why Should You Try It? It is summer camp registration season, and that means it’s decision time! Summer is an ideal time for children to be outside, but choosing between camp opportunities can be overwhelming. How do you pick between dozens of options? 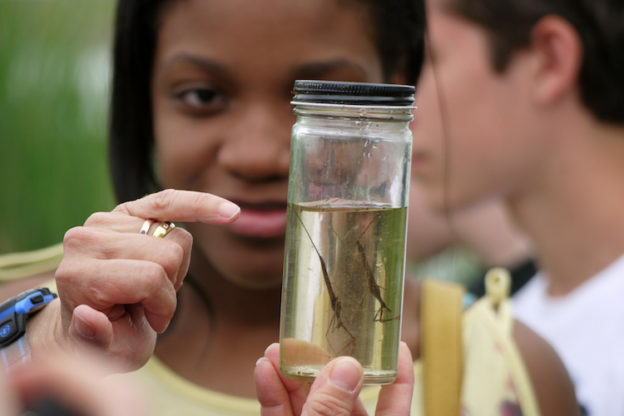 And why should you consider nature camp? According to studies done by Common Sense Media in 2017, children ages 4–8 spend three hours per day in front of a screen (outside of school), and that number climbs to over six hours once they reach teenage years. Our camp community is designed to turn that trend on its head and create a new, happy generation of nature enthusiasts who are comfortable in nature and just as excited to share it with others as we are. 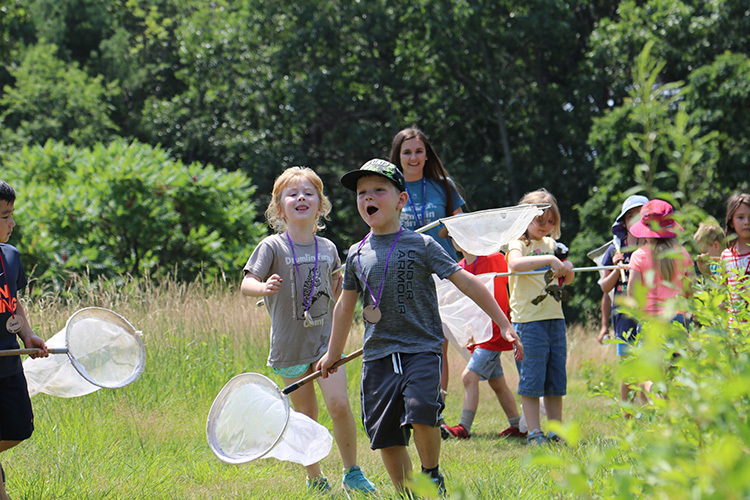 Mass Audubon campers laugh, sing, play, and do all of the wacky, fun activities that make summer camp special, and they experience hands-on learning in nature. Exploration and discovery fuel our programming, because campers are curious. 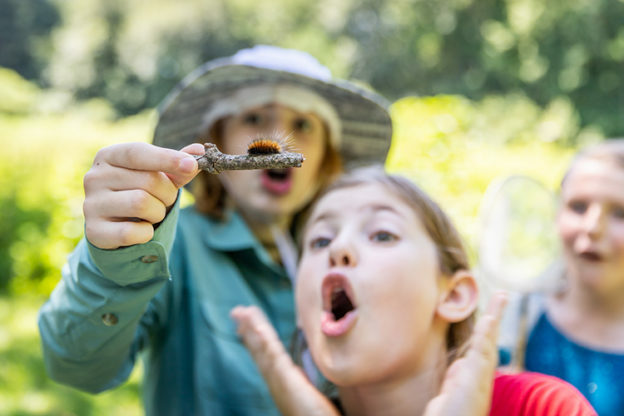 Camp activities include things like carefully rolling logs in search of salamanders, dipping nets into ponds to catch water bugs, paddling Massachusetts’ rivers and estuaries, exploring salt marshes for crabs and eels, and tagging butterflies in meadows. 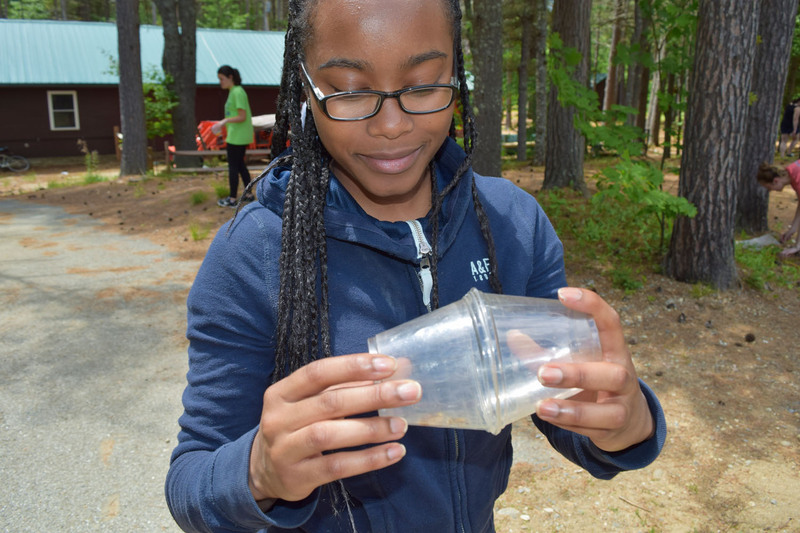 We believe giving campers the opportunity to learn about their surroundings creates better outdoorspeople, community members, and future environmentalists. Additionally, it teaches campers valuable skills like creativity, observation, and self-confidence while giving them opportunities to move and play in both structured and unstructured ways that stimulate mental and social growth. Our unique and wonderful summer staff help make this possible. We hire counselors who have experience working with children and a passion for sharing their knowledge of the outdoors. Some counselors join us for specific programs based on their area of knowledge in order to deliver the best possible program for our campers. Paddling instructors, nature photographers, birding experts, professional artists, and others enrich the camp experience. Many campers become Counselors-in-Training (CITs) as teens and eventually staff. Some even go on to be leaders in the environmental and education fields. 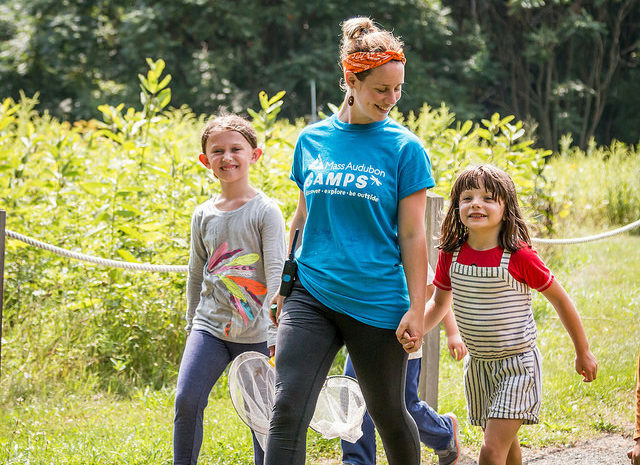 Mass Audubon offers 20 different camp experiences, from day camps for four-year-olds, to overnight camp for children in elementary and middle school, to teen travel and adventure opportunities—all focused on connecting your child with nature. Come for a summer experience filled with all the magic and wonder of traditional day camp, and stay for the wildlife, exploration, and new friends. 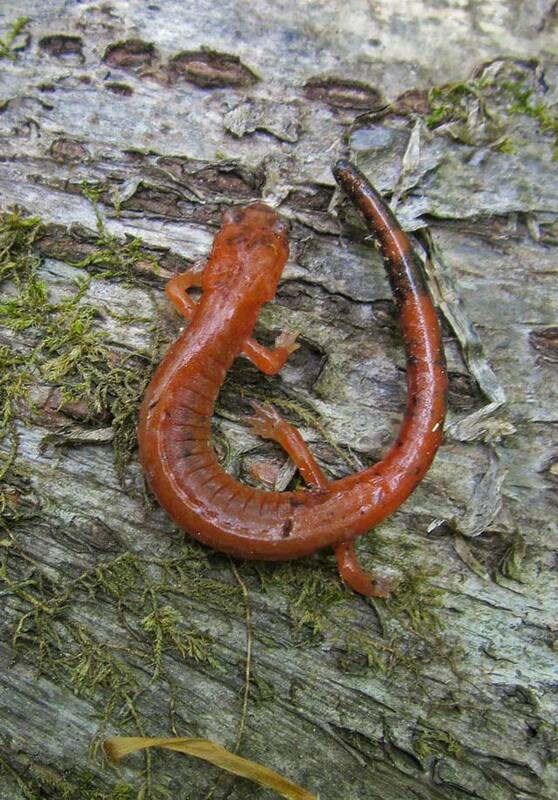 Laugh, love, and learn something new at a Mass Audubon camp this summer! 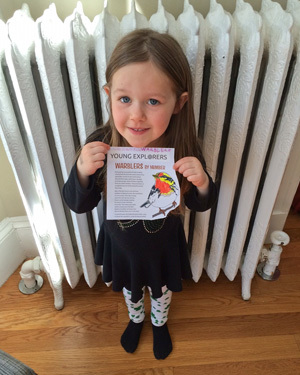 This entry was posted in Get Outdoors, Young Explorers and tagged camp, day camp on January 31, 2019 by Mass Audubon. Posted on October 24, 2018 by Hillary T.
Children have wonderful imaginations and an innate desire to explore the world around them through direct experience, and the natural world provides endless opportunities for exploration and discovery, questioning and investigation. Spending time outdoors is often thought of as recreation but so much learning in the STEM fields (science, technology, engineering, and math) can happen at the same time. creativity and inventiveness through the construction of animal homes with twigs and pine needles or imaging the life cycle of the dragonfly larvae to adult though the dramatic play at the pond’s edge. critical thinking through the open-endedness of learning in and with natural materials by observation, asking questions, investigations, re-thinking things and asking more questions. By listening to the different bird songs in spring, noting the arrival of a dragonfly larvae in the pond, chasing butterflies in a field, timing the length of time it takes a maple leaf to drop to the forest floor, or carefully noting the shape of winter’s first snowflake, children gain these documented benefits while participating as a part of the cycles and systems of nature, all the while deepening their connection, appreciation, and sense of stewardship for the environment. At Mass Audubon wildlife sanctuaries, STEM learning is a part of everything we do. Every one of our school programs is designed to integrate with the Massachusetts State Science and Technology/Engineering Curriculum Framework, but our commitment goes even deeper. Hundreds of classroom educators attend professional development programs run by Mass Audubon each year to increase their comfort with integrating nature play and learning into traditional preschool and elementary education curriculum. And through our nature preschools, camps, and school programs, we reach tens of thousands of children annually. Beyond the traditional educational setting, STEM thinking is reflected in how we invite people to approach the environment and how we manage our sanctuaries. Scientific practices and monitoring guide the stewardship of our properties, with scientific data collection taking place year-round related to breeding bird activity, wildlife populations, the spread (and control) of invasive species, and many more research opportunities. We embrace evidence-based thinking in all we do, and we invite you to join us in exploring how learning STEMs from nature. Get outside where every day can become a STEM day! Visit a Mass Audubon sanctuary near you to explore on your own or through one of our thousands of hands-on educational programs. This entry was posted in Get Outdoors, Science, Young Explorers and tagged education, Preschool, school, STEM on October 24, 2018 by Hillary T..
Posted on April 3, 2018 by Hillary T.
If you visit the Museum of American Bird Art (MABA) in Canton, you can see works by Andy Warhol, Barry Van Dusen, Frank Benson, John James Audubon, and Noah, age 8. 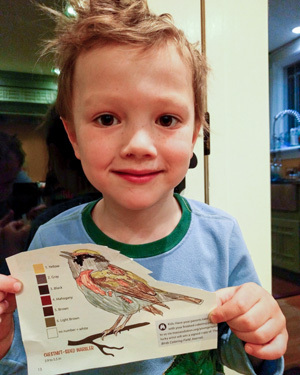 Noah, who lives in Holliston, is one of the many young artists from around the country who has participated in MABA’s Taking Flight: Juried Youth Bird Art Exhibition. 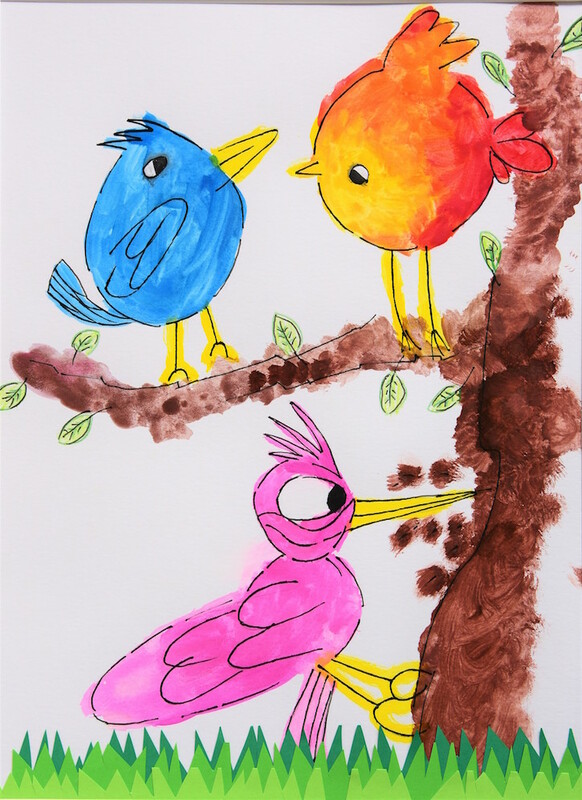 For the past 2 years, the museum has put out a call to children ages 4-18 to submit their drawings and paintings of birds. Of the submissions, 28 are chosen for the exhibition, the opening of which includes a chance to meet renowned bird artists such as David Sibley (2016) and Barry Van Dusen (2017). His piece Tweety Birds, Tweety Birds What Do You See? I See Beautiful Colors All Around Me, was selected for the 2017 exhibition and is now on view at MABA. This is something Noah is especially proud of—a feeling he wishes everyone can experience. “I hope anyone who likes to draw takes the opportunity to enter!” Noah said. And now’s your chance. The 2018 exhibition is accepting entries through June 15, 2018. 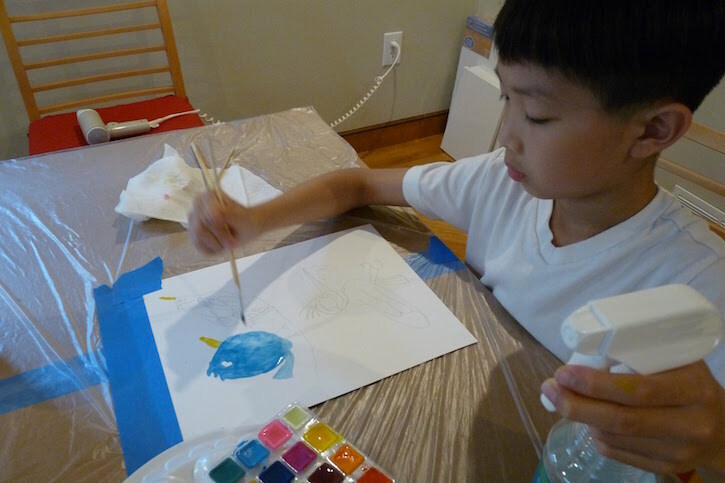 We’ll be featuring more young artists on MABA’s blog, so be sure to subscribe! This entry was posted in Young Explorers and tagged art, nature hero on April 3, 2018 by Hillary T..
Posted on July 26, 2017 by Hillary T.
When it comes to cool insects, it’s hard to beat fireflies. 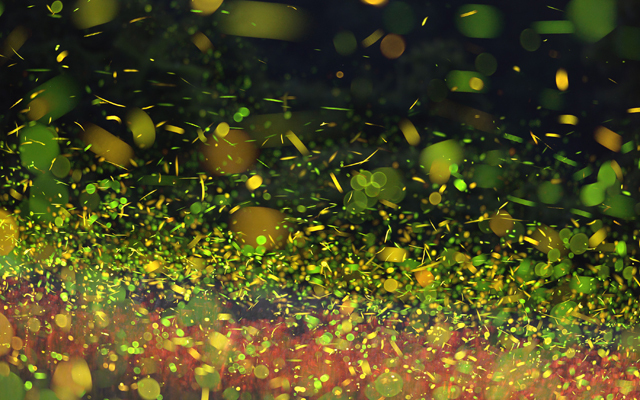 Not only do they light up a dark summer night, but they also send secret messages, trick other fireflies, and can even be poisonous to some predators. 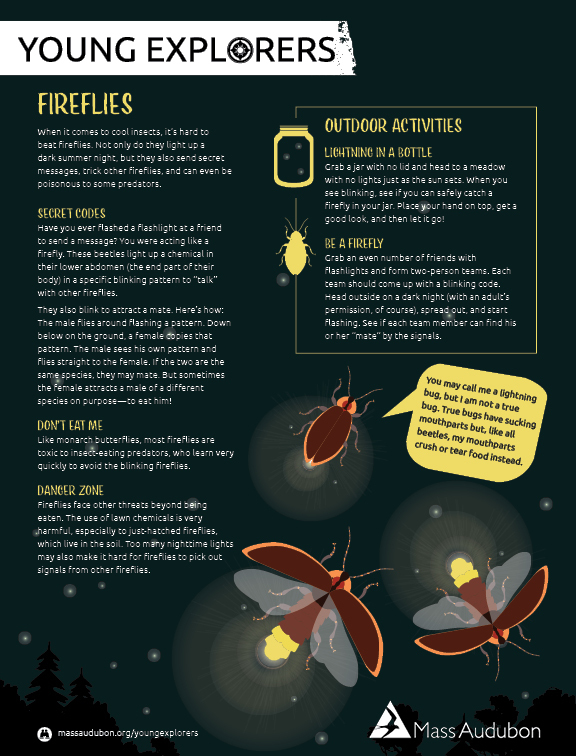 Get more details and find fun firefly activities in the most recent Young Explorers Activity Sheet and let us know if you have seen fireflies this summer in the comments. 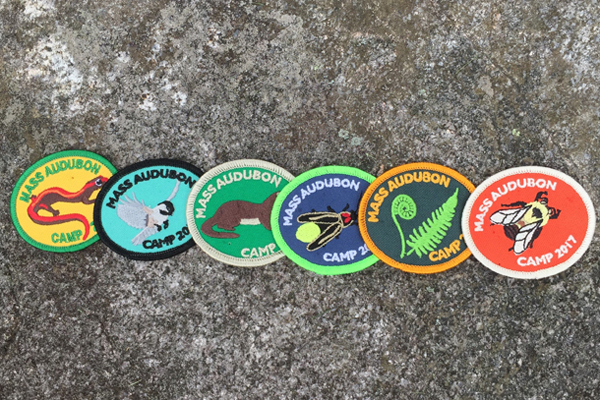 This entry was posted in Young Explorers on July 26, 2017 by Hillary T..
Posted on July 19, 2017 by Hillary T.
Every year, campers at Mass Audubon’s 18 day camps and Wildwood, our overnight camp, receive a patch at the end of their session. These patches have featured everything from fireflies to fiddlehead ferns. The last six years of camp patches. This year’s patch shines a light on bees, but not just any bee. It’s the rusty patched bumble bee (Bombus affinis). This important pollinator that officially landed on America’s endangered species list. It’s the first time in our nation’s history that a bee species is under federal protection. As recently as 30 years ago, this bumblebee was commonly found in a variety of habitats including prairies, woodlands, marshes, agricultural landscapes, and residential parks and gardens. Their precipitous decline started in the mid-1990s, and today they are very rarely found anywhere. At Mass Audubon, we’re protecting and maintaining old field habitats and designing pollinator gardens to support these bees and many other pollinators that live in the Commonwealth. We’re also supporting state legislation, An Act to Protect Pollinator Habitat (S.451/H.2926), establishing a commission to improve pollinator health by increasing and enhancing native pollinator habitat, as well as other legislation to reduce pesticide use and establish official guidance for pollinator forage. Want to help the rusty patched bumble bee and other pollinators? Get the buzz on other pollinators in Massachusetts. 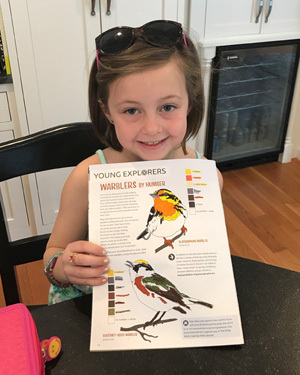 This entry was posted in Advocacy, Get Involved, Young Explorers and tagged camp on July 19, 2017 by Hillary T..
Posted on April 4, 2017 by Ryan D.
In the spring issue of Explore member newsletter, we asked kids to fill in a color-by-numbers page of native warblers and send us a picture of themselves with their completed coloring sheet. 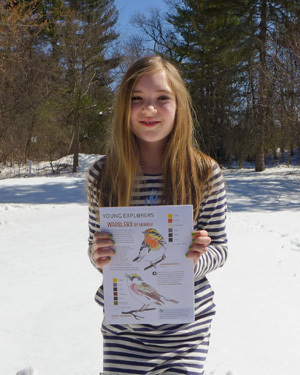 One lucky artist will win a copy of the Sibley Birds Coloring Field Journal, signed by David Sibley himself, and the entries have been pouring in! Here are a few of the entries we have received so far. It’s hard not to love seeing all these smiles! If you haven’t already, it’s not too late to enter the contest. Simply download and print the Warblers By Number activity sheet from our website and send us a picture of you with your completed coloring page. The winner will be chosen on April 14, so don’t delay! This entry was posted in Stuff We Love, Young Explorers on April 4, 2017 by Ryan D..
Every year parents and campers tell us what they love most about Mass Audubon camps—being with friends, making new discoveries, seeing wildlife up close, and all of the outdoor adventures from hiking and canoeing to experimenting with science and creating nature-themed art. Campers aren’t the only ones feeling the love. A few of our Camp Directors share what they love most about their role and what they hope campers take away from their summer experience. Learn more about one of our award-winning 18 day camps and Wildwood, our overnight camp. This entry was posted in Young Explorers on February 13, 2017 by Heather. Getting Fired up for Summer Camp! 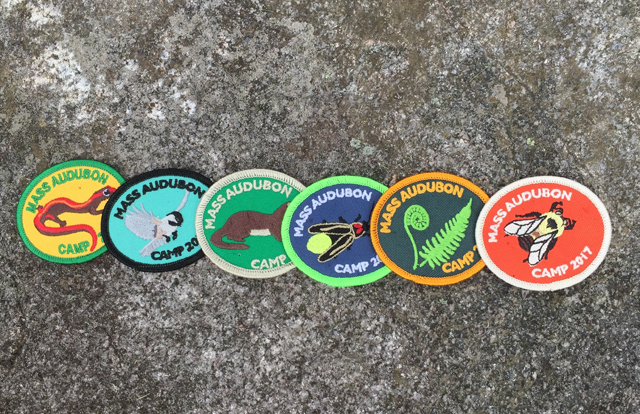 Posted on June 22, 2016 by Ryan D.
Over the next few weeks, Mass Audubon will be welcoming new and returning campers across Massachusetts and in Rindge, NH. Last week, Wildwood overnight camp hosted 140 new and returning Mass Audubon camp counselors from Pleasant Valley in Lenox to Joppa Flats in Newburyport and everywhere in between for the annual Field School. Field School is a unique opportunity for counselors from camps across Mass Audubon’s sanctuaries to come together to share songs, stories, and experiences, and learn new skills and fun nature activities to share with their campers. Check out photos and stories from Field School at the Word from Wildwood blog, and let us know in the comments: What are you most excited for at camp this summer? 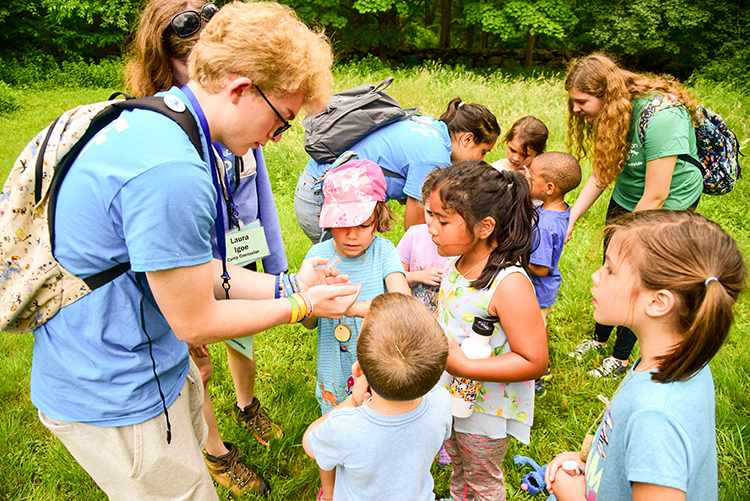 Counselors learned about the life cycles of butterflies and dragonflies, lessons they can share with their campers this summer, and went on a Bug Hunt. This counselor captured something neat in her bug cup! What could it be? This entry was posted in Young Explorers on June 22, 2016 by Ryan D..
Posted on June 6, 2016 by Ryan D.
Let’s face it—kids love the “Yuck Factor.” And thankfully, there’s a lot to learn from the world of slime! At Mass Audubon’s wildlife sanctuaries, kids are encouraged to look under rocks and rotting logs to see what they can find, because there’s a whole world of wonder waiting to be discovered. We’ve rounded up more than two dozen upcoming programs for Young Explorers that feature frogs, pollywogs, snakes, worms, slugs, bugs, bats, and all manner of creepy crawlies! 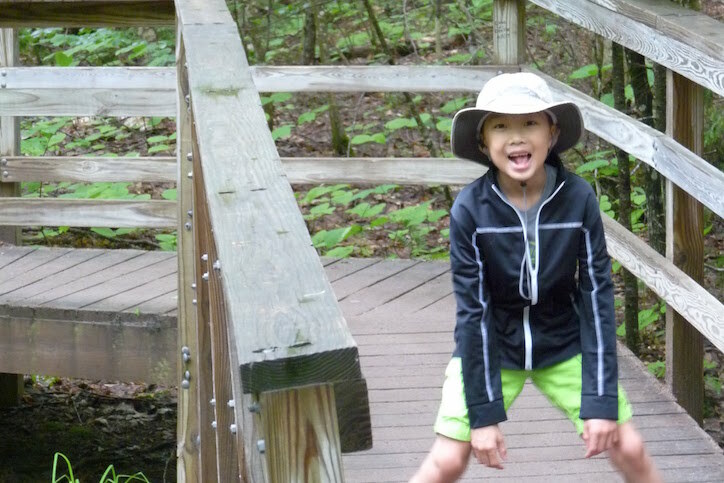 This entry was posted in Get Outdoors, Young Explorers on June 6, 2016 by Ryan D..